The running boards on your Tacoma make it easy to get in and out of the cab. In addition, they add to the style of your truck. Running boards are subject to a lot of potential abuse simply because they’re built to take on the tough jobs like protect the sides of your truck. A running board sticks out, so if you happen to be off-road, you run the risk of running over tree limbs or other debris. If the running board becomes damaged or needs to be replaced, be sure to replace it with OEM Tacoma running boards for a factory fit and performance. Genuine OEM Toyota parts and accessories never need to be modified to fit. At Olathe Toyota Parts Center, we offer wholesale pricing and superior customer service from an experienced staff. 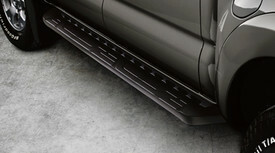 Buy your new OEM Tacoma running boards now.